It couldn't have been scripted more perfectly, the Belfast Giants' own Saint Patrick delivering two points to his team on St Patrick's Weekend. Giants forward Patrick Dwyer scored both goals in Saturday's 2-1 win over the Coventry Blaze - his 24th and 25th of the season - to make it a weekend double after their 4-1 win over the same opponents on Friday. As a result, the Giants (41-12-2) close the gap to the Cardiff Devils at the top of the Elite League to just two points with five games remaining, while Cardiff's loss to the Sheffield Steelers also handed the Giants the Erhardt Conference title as well. 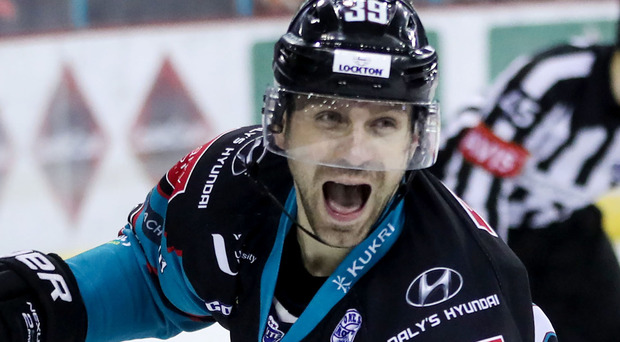 There were fears that after last week's Challenge Cup victory, the Giants could take their eye off the ball on their return to league action, but Dwyer insists that was never a possibility. "It's easy (to refocus) when you look at what's at stake in the long run and when you consider what we have to do to be in with a chance of doing it," says the former NHL veteran. "It's easy for this group of guys to have fun during the week and enjoy the process, but when it comes to game time we find a way to get it done." It was a great weekend for the Giants, who rode some stellar netminding from backup Stephen Murphy - 68 saves on 70 shots across the weekend - to two wins, while also closing the gap to the Devils. "We were good. Give props to Coventry, they came in both nights and pushed us to the brink, but we found a way as a team," said Dwyer. "Our special teams came through big for us, and that's what you need at this point in the season." The 35-year-old is refusing to be drawn on any premature title talk, however, with all of Dwyer's experience telling him all the Giants can do is concentrate on themselves down the stretch. "Over the final two weeks of the season, we just need to watch our own performances and take care of what we can take of," insists Dwyer. "If we do that then the league will fall where it falls."